I remember the feeling of going to the airport for the first time. It was extremely exciting! Not to say I don’t still get excited, but it’s a different kind of excitement. These days, I’ve become less enthusiastic about the journey to the destination and more keep on just getting there. I can’t tell you how many times I’ve wished upon a birthday cake that time travel would become mainstream so I could avoid flying. I would rather skip this whole flying process and just arrive at my destination. At least I felt this way until my recent flight with LOT Polish Airlines. 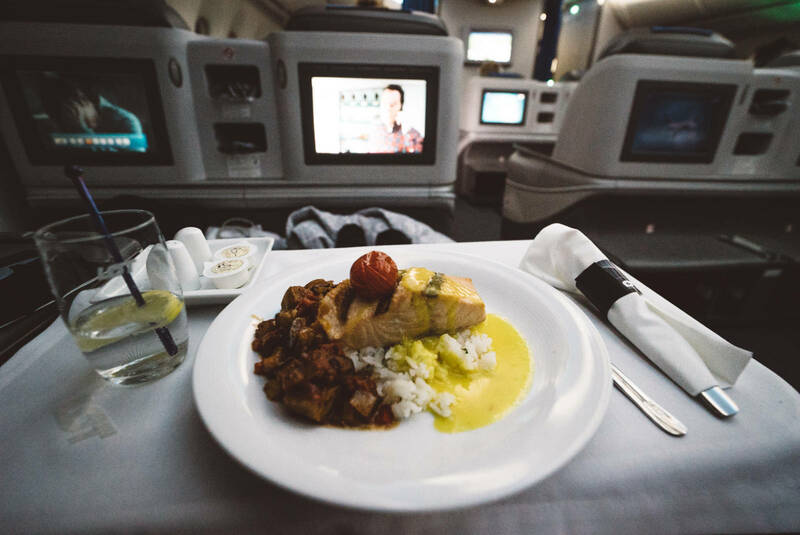 After 13 years of travel and over 1000 flights, Siya and I finally got a taste of business class, and it was very, very, tasty. I've forever been imagining what business or first class would be like. In fact, I have a very clear image chiseled into my mind of the fashionably dressed, content looking passengers I’ve passed on my way to my beautiful middle seat squished between a crying baby and snoring gentleman. On my recent flight from Toronto to Poland, I got to be one of those fancy people (and not just in my head), except I was wearing sweats and my hair looked like a vacuum attacked me. I call that high fashion. On the day of our flight, I felt that excitement I got during my first trip. Something new and magical was about to happen. Although Siya and I typically pack carry-on luggage and a couple of backpacks, we had to bring checked luggage this time around. Checking a bag has always been a nightmare of mine (hence why I've learned to pack more efficiently and do carry-on only). Whenever I've checked a bag in the past, I’d have to wait an hour in a lineup before boarding and another 30 minutes at the belt upon arriving at my destination. I’d rather spend this time reading trashy magazines and getting a head start on my trip. There’s also the fear of losing luggage, which has happened to me more times than I’d like to remember. 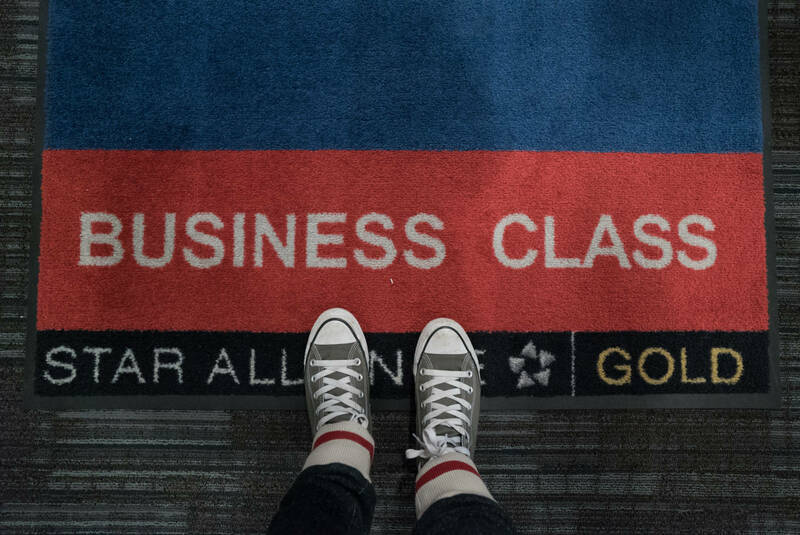 This time around, we got to go to the business class check in line. This took a total of 5 minutes to get through. Incredible! When we got to our destination, our luggage came out first and had a big orange sticker on it that said "priority." Yay for packing more clothes this time around! Next came the lounge access. Now, we already have access to the Maple Leaf lounge because of our American Express Credit Card, but for those who don’t, this business class perk is pretty fantastic. In the lounge, there are comfy chairs everywhere, an all-you-can-eat buffet and self-serve bar. Hello gin! There are even showers if you feel like freshening up. When it came time to board the plane, we got to be the first! I've always wanted to be one of those people. Upon stepping into the plane, I was smacked in the face with the most beautiful scene in all of flying history. A beautiful, clean and spacious business class seat that matched the ticket I had in my hand. This was the real deal, and I wasn't going to pretend to be chill about it. I think I filmed at least 10 Instagram stories before take off. Now, that's excitement. My luggage went into the massive overhead bin and the very nice flight attendant took my coat and hung it up in a private closet. Yup. No shoving my $50 rain jacket in an overhead bin this time. I took my seat and was immediately handed a glass of champagne, followed by a delicious piece of sushi and hot towel. This all happened before my shoes were even off. Sigh. This is the life. Since it was an overnight flight, I should have spent the entire 8 hours sleeping, but how could I? There were so many things to keep me occupied! 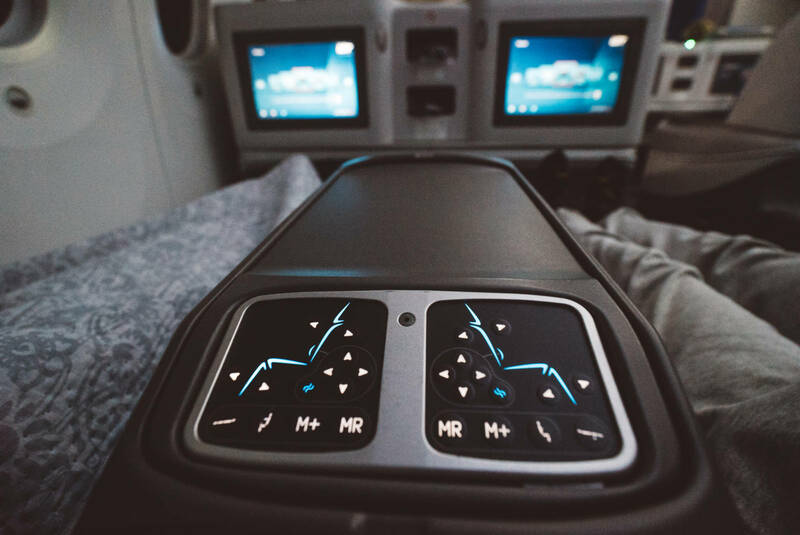 I had a massive (well airplane massive) TV screen in front of my with at least 10 movies I wanted to watch, gourmet meals that kept coming my way and several fancy buttons that made my chair do cool things. 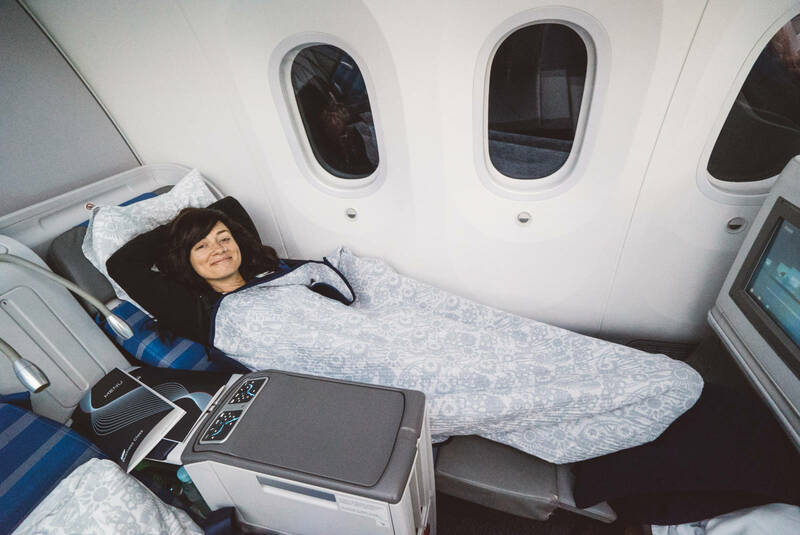 I ended up sleeping for 4 hours in my airplane BED! Yes, the seat turned into a an actual bed equipped with a full size pillow, bed sheets and comforter. Pinch me. Following a very lovely breakfast, the pilot announced over the PA that we would be landing in Warsaw shortly. I was actually upset about arriving at my my destination for the first time ever. For someone who gets very anxious about flying (yes that's right, the full-time traveller hates flying), I did not want to get off the plane. 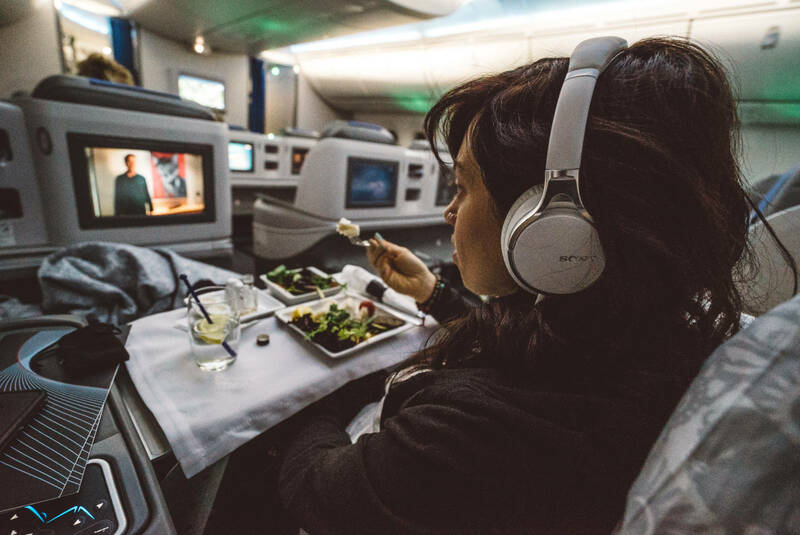 I wanted the flight to be longer because I was very much enjoying the entire business class experience. But, as all things eventually come to an end, so did this. I'll forever remember it though. In fact, it will forever be ingrained in my brain for the many other times I'm stuck between the crying baby and snoring gentlemen. 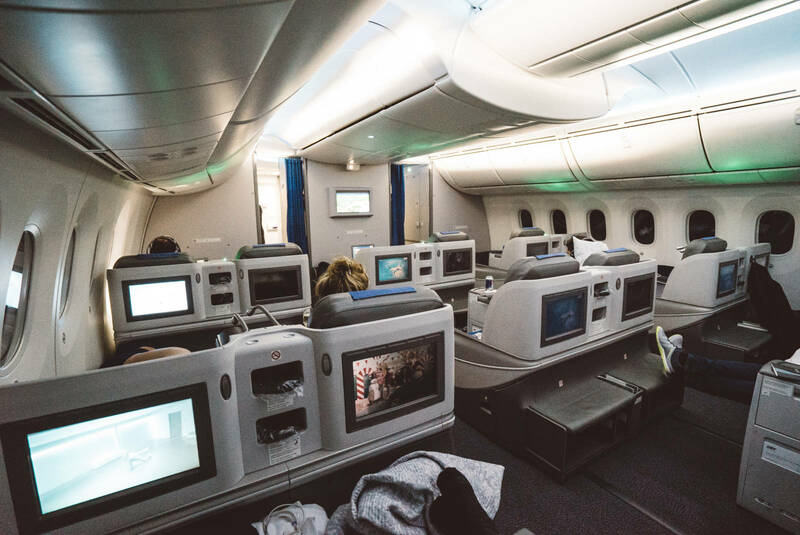 Have you ever flown business class? How was your experience? A special thanks to LOT Polish Airlines for sponsoring our flight. Want access to travel deals, giveaways and more? Sign up for our newsletter! Life is good in business class! Oh yes it is! Haha. You lucky duck! You must have been squealing inside haha. I know I would have been.